The EMMIS voltage battery charger provides DC voltage of constant price, depending on charging scale that has been selected. 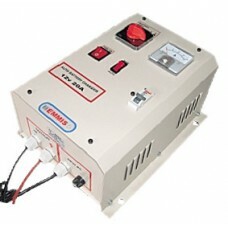 As the capacity of accumulators is increased, the charging current is decreased. The charging is interrupted automatically, after the battery’s voltage price reaches in extreme high (14,4v and 28,4v for batteries 12v and 24v, respectively). When the charger remains permanently connected in the source of supply, the charging will begin again when the battery’s voltage price reaches in the extreme low (12,2v and 24,2v for corresponding batteries) and the process is repeated.